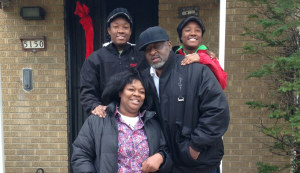 For Fullilove, who once briefly lived with her family in their car, owning her own home was a defining moment. For two decades, Mary Fullilove spent a great deal of time and energy moving her family from one temporary residence to another. Then she was introduced to ACTS Housing and her living situation — and her life — were transformed. Now, she is the proud owner of a house on North 40th Street. “The people at ACTS really are angels,” Fullilove said. She learned about ACTS through a friend and was immediately intrigued. After a meeting with housing specialist Mary Leach-Sumlin, she realized that she too could become one of the more than 1,600 families ACTS has partnered with over the last 21 years. Hard-working families like Mary’s have earned their share of the American Dream with support from ACTS, dramatically improving the quality of life in their neighborhoods. ACTS helps create an individualized road map on personal finances and credit management success, breaking down the barriers that often prevent people from pursuing home ownership. ACTS can also represent families in real estate transactions and coordinate rehab plans for a newly purchased house. Now that she doesn’t have to worry about moving from location to location, Fullilove can focus her energy on her work and family. She devotes some of her free time to helping teenagers whose mothers are battling drug abuse and other serious issues. She creates a safe environment for these teenagers to discuss their family life, bullying, gangs and peer pressure. “ACTS gave us a home and a permanent address,” she said. “They don’t realize how much they help people.